I reside in Alaska, which means I live in an igloo where snow blizzards rage year-round; however, yesterday was a gorgeous summer day up in the 70s, so our neighbors busted out their waterslide. The kids got into a romping game of "Aliens," which involved chasing and shooting and lots of screaming in delight. 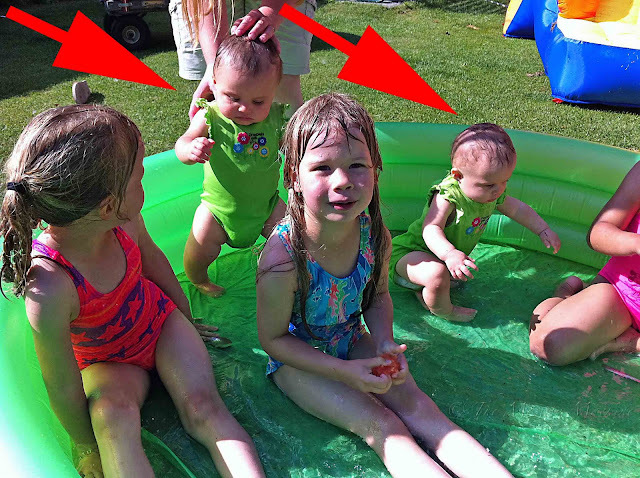 My 5-year-old daughters thought these twin babies were pretty cool and screeched, "They're twins, too! They'll grow up to be just like us!" I do believe I detected shudders of horror rippling through the shoulders of the other adults standing around in the yard. Yeah, well, enjoy the gentle splashing and matching swimsuits while you can, people. Your time for "Aliens" is coming. That looks like a FUN slide set up there. That is the most impressive yard inflatable I think I've ever seen. My boys were playing a very loud games of "Transformers" yesterday, that involved a lot of screaming and shooting sounds, and all I could think is "what happened to my babies?" What wonderful time of water play! That is an awesome set up for the kids when the weather is warm and the snow melts away. 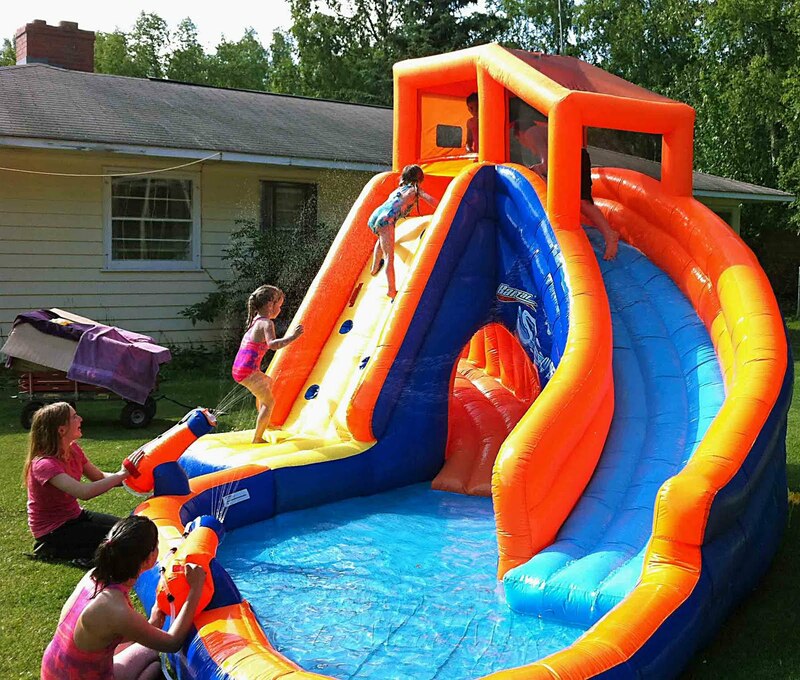 :)...I can't help but thinking how comes I didn't have a water slide as cool as this one when I was a child? (uh oh, i feel a bit of envy coming on....i wanna play 'Aliens too' )....:) They're living the good life...that's really wonderful!! I saw that slide in a Target ad a couple of days ago and thought it looked like the coolest thing EVER. Seeing your pictures of the kids having such a blast only confirms that. I want one! It's funny, but my boys have no concept that they are twins. Rachel knows, and tells everyone, because she's so proud. So cute! Just out of curiosity, how hot was it? Us in the lower latitudes might find your 'summer' temps too cold for swimming :) Here's hoping you get lots of use out of your neighbor's pool! That particular day's temp topped out at 72°, but it felt really warm and wonderful! The water, on the other hand, came from the hose . , , and was FREEZING! ISn't it amazing how kids can handle cold water? I used to. Then I got old.